TKA company has been in the market for 20 years. This essay is an attempt to describe our rises and falls and hopes about the future from our own viewpoint. 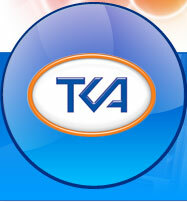 TKA Scientific Instruments (hereafter - TKA) is registered since 1991 and is a limited liability company. Its authorized capital equals Rb 3 million. The company promoters are citizens of the Russian Federation. TKA develops and manufactures optical measuring equipment and is at this date the key supplier of these products in the Russian market. Since 1999 we have been manufacturing microclimate parameter meters, i. e. temperature, humidity, and air velocity meters. All the equipment made by us has gone through State Testing procedure, is included in the State Measuring Devices Register and recommended for use in controlling and law enforcement organizations. TKA carries out research and development for its own needs as well as on request of ministries, Departments, organizations and enterprises. We are a scientific organization accredited by the Ministry of Industry, Science and Technology of the Russian Federation. All-Russian State Restoration Institute, Dedo Light (Munich). The products of TKA has been repeatedly rewarded with diplomas and certificates at the international exhibitions and fairs, included in TASIS program after the company's winning the tender, and is now exported abroad. TKA possesses its own production and research capabilities with state-of-the-art equipment operated by qualified specialists. The company's metrological service is authorized for calibrating operations by the State Norms Compliance Committee. The demand for the means of measuring optical radiation has been constantly growing in recent years. 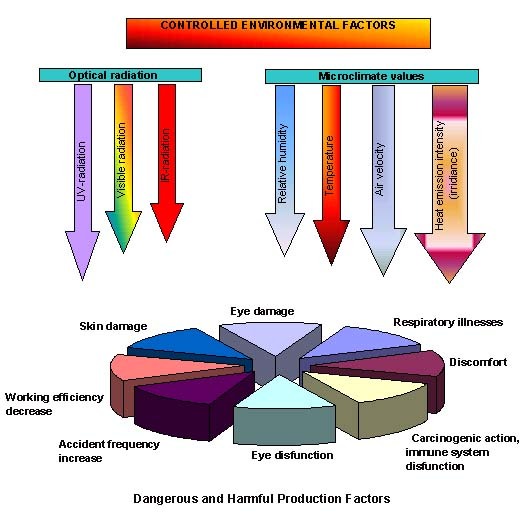 The reasons for this are: manufacturing of large numbers of new kinds of illuminants, use of various kinds of radiation in technology, as well as stiffening of requirements towards the control of physical environmental factors influencing the human organism. Great diversity of measuring devices being manufactured allows the customer to make the most rational choice. The tendency for appreciation of power resources leads to the necessity of scrupulous heeding of their consumption cost. For such organizations as museums, banks, stadiums the cost of electricity may comprise a bigger part of their expenditures. Our approach to creating new types of measuring devices has been changing in line with the company development and motivational behaviour of the product consumers. The development of the first instrument - TKA-01/3 luxmeter/radiometer - was carried out in collaboration with the lighting engineers of the country's leading museums: the Russian Museum, the Hermitage, and the Tretyakov Gallery. This is common practice as museums and libraries were at the first the main consumers of this instrument. The distinctive of the development process was that in line with the development of the instrument itself, the problems, especially metrological, being numerous, a thorough market research was conducted. Thus the promotion strategy for TKA-01/3 became evident already with the emergence of the very idea of developing such instrument. It is common practice nowadays, but in 1994 it was not. The development of new measuring devices for printing trade and cinema industry. Meeting the demands of our key accounts we started to manufacture the meters of other microclimate parameters as well (humidity, temperature, air velocity). The instruments capable of simultaneous measuring of several parameters are our most saleable articles. The next step of our business strategy was the development of instruments along with the issuance of the command papers regulating the optical parameters to be measured, or even somewhat earlier. TKA-04/3 luxmeter/Luminance meter, currently the most popular photometer model, was developed in collaboration with the developers of sanitary requirements and state standards for the personal computer monitors. Due to their help the characteristics of display Luminance measurement were taken into account. At the same time the instrument is a universal illumination intensity meter. 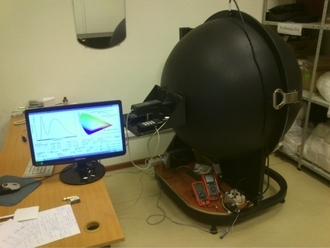 Similarly the work over the TKA-ABC ultra-violet radiometer was carried out. This instrument can be considered an important achievement of Russian instrument building. Its purpose is to measure ultra-violet radiation within the spectral regions UV-A (315-400 Nm), UV-B (280-315 Nm) and UV-C (200-280 Nm) stipulated by current specifications. It is the first time when such measurements can be performed by one compact instrument, which allows improving both the methods of measurement in different conditions and the accuracy of measurements. In course of development of the measurement channel for the UV-C region the method of measuring anti-bacterial radiation in compliance with the recommendations of the RF Ministry of Health due to be published at that moment. Recently TKA began working in the field of elaboration of tutorials and manuals for potential users of our measuring equipment. These instructional materials range from simple explanations of the operating principles of our instruments and information about maintenance and service to elaboration of technical standards and schedules. This requires a great volume of research work. We aim at helping our potential customers obtain a modern view on metrological basis of optical measurements and confidence in accuracy of measurement. In future we plan to establish closer contacts with high schools. Our company is interested in participating in training of specialists capable of measuring the indoor microclimate parameters. Such knowledge put into practice can be an additional stimulus for improvement of measuring equipment. We also hope to involve students and young specialists in our activity and invite them to participate in new projects. Since 2002 the company has been holding practical classes in lighting engineering and photometry for students. Two study guides are due to be published. 3 members of staff have successfully defended their dissertations (1 Doctor of Science and 2 Doctors of Philosophy). 2 members of staff are candidates for Ph. D. and Doctor's degree). Yuriy A. Barbar Ph. D.
The development of the new type of medical diagnostic equipment consists of many stages, from the idea to full-scale production. The difference in comparison with ordinary measuring equipment is evident. For instance, medical equipment certification includes lengthy medical testing procedures, which delays the marketing of the equipment for more than 1.5 years. Our new unrivalled diagnostic device provides the possibility of early diagnostics thus helping to preserve health of thousands of people. The new non-invasive technique developed by young specialists of one of the leading technical universities of St. Petersburg helps to avoid injury and to minimize the time and costs of examination. We are sure our commercial calculations will prove correct - our income will cover all the investments and the company will enter the market of medical equipment. At present our designing team is working over other instruments for diagnostics and therapeutic procedures. Like everyone in our country, many times we found ourselves in dire straits. It is only recently that production as such and, in particular, production of measuring equipment became commercially attractive. Our company begun from the ground up and therefore was extremely sensitive to economic changes and experiments, macroeconomic processes being equally essential for a company whose key accounts were state enterprises and organizations. 1. The proper choice of market segment. certification as well as during production. 4. The highly professional and devoted staff. The last item should be mentioned in detail. I believe this to be a characteristic example of effective state support of knowledge-intensive production. During the first years of its existence our company comprised but a few individual enthusiasts and had been developing the next generation instruments for measuring optical radiation. On the basis of our own market research the effective demand was estimated. The next step after the samples being ready and having gone through production tests (1994 - 1995) involved state tests and starting full-scale production. In 1996 we received a loan from the Foundation, and the production began. Constant increase of competitive ability and occupation of new markets called for extensive research. For instance, we needed to design instruments for checking compliance of UV radiation level in production premises with standards. Russian and foreign instruments used at that time were incapable to fulfil the measurements required. Additional research of the optical elements' properties was necessary for carrying out spectrographic correction in the desired range; metrological support of the measurements was needed as well. Without all this entering the market appeared prospectless. Customers agreed to purchase the instruments meeting the requirements above. For TKA it was a new decisive step in conquering the market. And we made it! All necessary research was carried out with the backing of the Foundation, and the unique three-zone UV-radiometer TKA-ABC went in full-scale production in 1999. By that time we had already been selling our optical equipment in hundreds of cities in Russia. Besides ilLuminance measurements our customers also needed other microclimate parameters to be measured, primarily temperature and humidity. Our dealers insistently pursued us into production of new kinds of equipment, the Russian instruments made at that moment being unreliable and their service life being short. The thorough analysis of different types of instruments and measuring devices was made. In collaboration with the experts from Technological University the unique research and calibrating equipment was designed for checking humidity meters. Good reputation of TKA optical equipment allowed us to take good stand in the market of microclimate controlling devices as well. Soon, however, we were confronted with certain problems. The methods used for calibration of humidity meters had demerits caused by unit transfer from the primary standard made via variable-capacitance transducers, whose characteristics are instable. Our experience in optics allowed us to suggest the optical hygrometer, whose readings are based on physical constants, as a standard meter. We had to develop a meter of a basically new type, separate research being necessary for the majority of its elements. This problem was also solved thanks to financial support of the Foundation. At the International Hygrometry Congress held in September 2002 the optical hygrometer TKA-MK was demonstrated. It awoke great interest among specialists, and until now we have been receiving accolades and collaboration proposals. Having entered (rather modestly) the foreign market, we found that in EU the attitude towards the problems of attestation and certification differs from that in Russia. In particular, private companies producing measuring equipment are entrusted with ample powers. The sameness of measurements being out of question, the instruments, including those for state purposes, are produced with the manufacturer's calibration. With the help of the Foundation we were able to make quick preparations and certify our own metrological service in the State Norms Compliance Committee. Thus the way for our customers to the necessary metrologically tested instruments became shorter. The company got additional profits and was able to fit its laboratories with new equipment. To conclude, the support given to our company has repaid our country a thousandfold: via production taxes, via creating 30 jobs, via import substitution products necessary for labour safety and health protection. 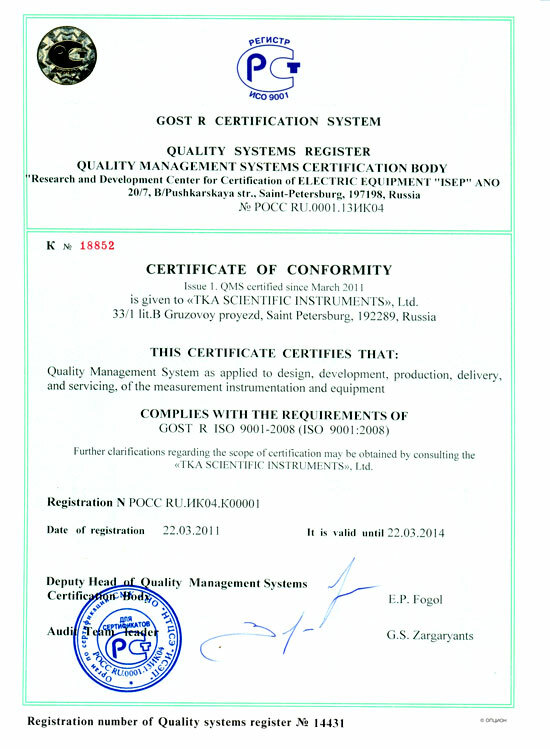 To ensure that we can meet the demands and expectations of our customers TKA Ltd. has developed and introduced its own quality management system compliant with the requirements of ISO 9001-2008, the latter fact confirmed by a certificate of conformity К №003620. Certification to ISO 9001 has been carried out by an officially authorized third company, which checks quality management systems for conformity to the standards and scrupulousness of their accomplishment. The ISO 9001 certificate is a trustworthy guarantee of the manufacturer's product range complying with quality standards. You can familiarize yourself with the company's quality control policy. We would appreciate your opinion on the quality of our instruments, as well as your suggestions and remarks. Contact us by e-mail: info@tkaspb.ru. We make every effort possible towards further improvement of our quality management system, so that our customers are certain about the compliance of every stage of production with quality standards.